Howdy pardners! I was moseying down a dusty internet trail looking at delay pedals when one caught my eye that I think is worth sharing. So everyone knows analog delays sound really good and most of them are at least loosely based on the sound of an Echoplex (fun and coincidental fact [for me at least]: In 1962, the Echoplex patent was bought by a company called Market Electronics based in Cleveland, Ohio. Yay Ohio!). Don’t get me wrong, they sound amazing, but I’m becoming a little desensitized to all the delay pedals that sound like another tape delay. The silly Portlandia-dwelling hipsters at Catalinbread took a look at recreating another popular, but perhaps less well-known echo unit, the Binson Echorec. The Binson Echorec is mostly known for being a big part of Pink Floyd‘s sound, as well as being used by other famous musician types in the 60’s. The major difference of the Echorec was it’s use of an analog magnetic drum recorder instead of a tape loop. It incorporated 4 playback heads and a spinning magnetic drum as its recording mechanism. According to Catalinbread, ‘The Binson…has long captivated musicians for both its rhythmic and ambient characteristics. We managed to include all the features of the original (and then some) while still keeping it in a small standard pedal sized enclosure.’ Way to go! Check out the video by Pro Guitar Shop. • The Swell knob controls the number of repeats regenerated – from a single repeat of each playback head to infinite repeats. • The Tone control tilts the EQ of the repeats from dark and fat to bright and thin. Dark settings makes the repeats sit in the background. Bright settings emphasizes the attack, great for playing off the syncopated rhythms of the multi-head arrangement. Makes me think of The Edge. • Mix knob goes from full dry to full wet giving a lot of flexibility to use the Echorec in a variety of situations, even wet/dry rigs by setting the Mix full wet. I like being fully wet. • The original Echorec had a 12 position switch which controlled the various playback head configurations. Since the original was mechanical with the disc only able to go one speed, not all combinations were available for use. 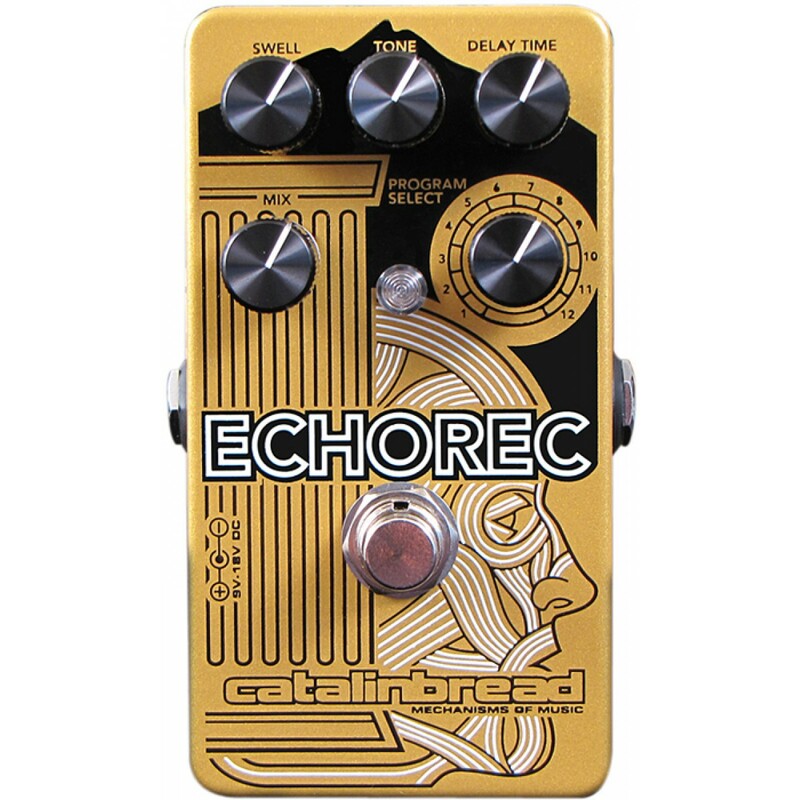 The Catalinbread Echorec changes all that. With the ability to vary the delay time on the single playback head, we were able to include all combinations, which include rhythmic patterns not available before. Sounds like a sweet idea. I have to admit I might end up with this on my board. What do you think about this pedal? Do you have a favorite delay pedal? Leave a comment and let me know! This entry was posted in Delay, Modulation and tagged Binson Echorec, Catalinbread, delay, echorec, effects pedal, guitar, oscillation, shoegaze, the pedal file, tone. Bookmark the permalink.